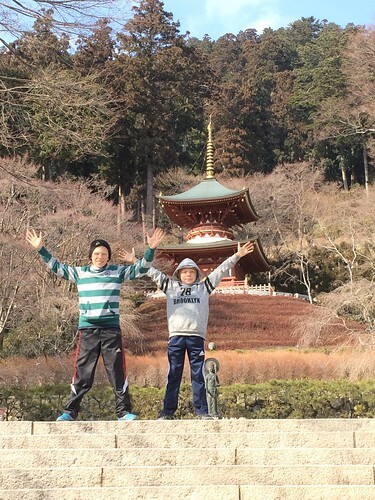 Today is a national holiday in Japan and so I took the boys on a hike up to the Katsuo Ji temple. 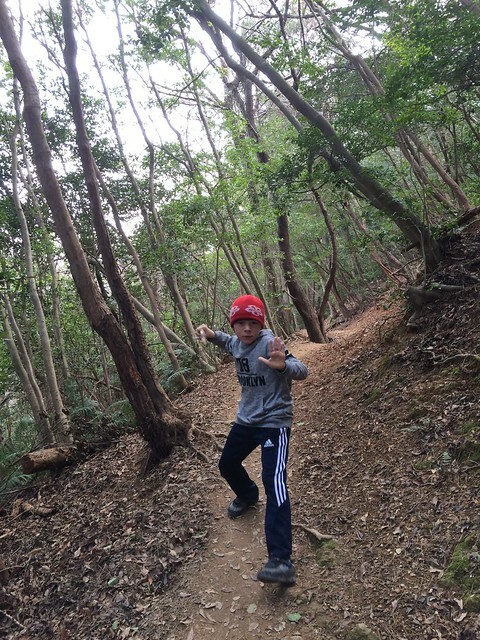 It is a Zen Buddhist temple about 4 kilometers away from our house, by a trail through the Minoh Quasi National Park. It was a special afternoon of father and sons bonding that I can’t express the amount of pleasure and pride I felt walking through the woods with my sons. We talked about movies, music, clash of clans, and whatever came into their minds. They are growing up and it is so cool to be able to have real conversations with them. They love stories so I explained to them the full story of classic movies such as the Planet of the Apes, Terminator, Blair Witch Project, etc. It was one of those afternoons that I would like to live over and over again! The walk is pretty much straight up from our house. We rode bikes the first kilometer, crossing the busy 171 highway, through the rice fields, to reach the border of the forest. We dumped the bikes at the gates and started the climb up the hills. It is pretty much going up the entire time, with some respites along the flat tops of the ridges. The trail is well-marked, both by the park officials and the temple pilgrims. We took a couple of rest stops and so the walk up took about an hour. The Katsuo Ji Temple was a beautiful destination. 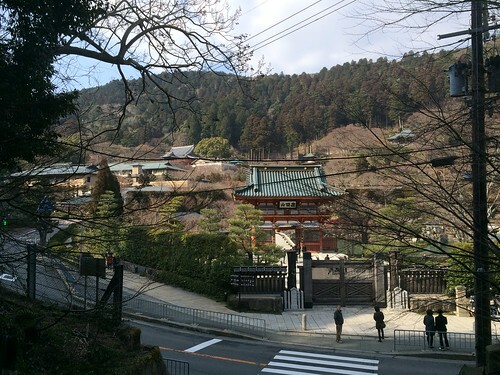 The 1,300 year old temple is known for the daruma (dharma) which are traditional Japanese dolls that bring “winning luck” to visitors to the temple. People come and purchase them to bring them resilance and fortune with many things, such as exams, trials, ill health, etc. If they do bring one luck, they are supposed to be brought back to the temple and placed on the grounds. 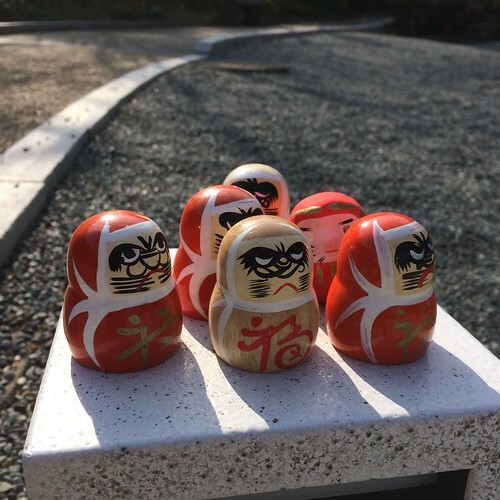 We saw them all over the place, so lots of people have been helped by the daruma. They are then burned on the day after New Years. Guests can stay on the grounds and there are gardens and pools for quiet meditation. The temple has a long history as described in the English guide to the temple. In 727, two priests, Zenchu and Zensan constructed a hut on the mountain. The son of the Emperor Konin established Mirokuji Temple on the spot in 765, in “his quest to reach the spiritual realm of Buddha.” The Emperor Seiwa regained his health miraculously due to the prayers offered by a priest at the temple, and thus changed the name of the temple to Katsuo (win over the Imperial Highness) Ji (temple). In 1184 the temple burned down in a civil war but it was reconstructed in by the first Minamoto Shogun a few years later. I highly recommend the hike up to the temple. You can get their by road as well, but the best way is through the forest. It makes for a perfect afternoon. 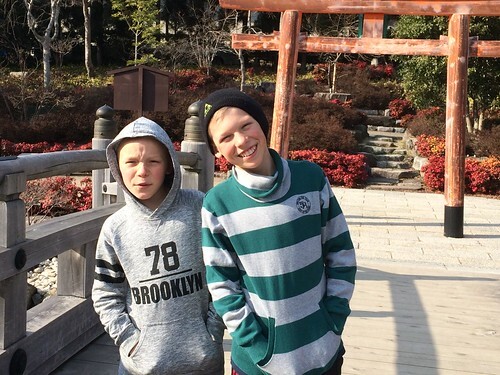 Thanks to Owen and Oliver for giving me a precious day.